Ultimate Ears 700 review | What Hi-Fi? 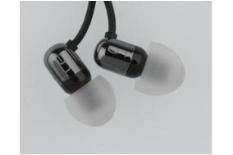 The Ultimate Ears 700s come packaged with six different types of ear bud (including foam tips) and a flip-top carry case. They even have a sound level attenuator, to drop the sound level if you're using them on a plane or train. The dinky earpieces can either hang normally or you can hook them over the tops of your ears. Either way, they boast unisex appeal and a good fit. Playing a track such as La Roux's In For the Kill highlights the strengths and weaknesses of the 700s: their jovial, enthusiastic delivery is endearing and a good match for the music, but this enthusiasm goes a step to far. La Roux's vocal sounds edgy and unnatural, spoiling what is a relatively decent sound. The 700s impress with their clear and open presentation, but once again, that overbearing brightness affects the piano and percussion, tainting an otherwise enjoyable sound.